It would be an understatement to say I’m a fan of Lori Nix. She is epically talented. I’ve followed her work for some years and was truly excited to get the chance to ask her these questions about it. 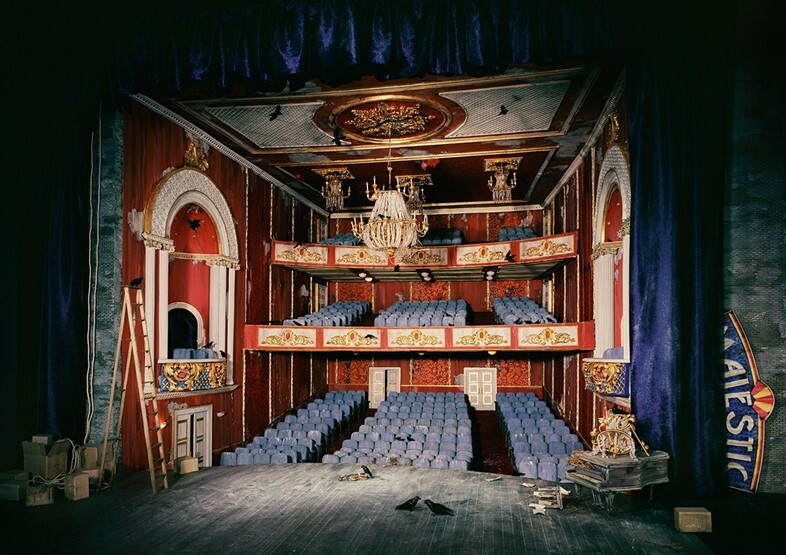 From her bijou apartment in Brooklyn, she builds and photographs dioramas by hand with her partner Kathleen, then photographing them on 8 x 10 format film. 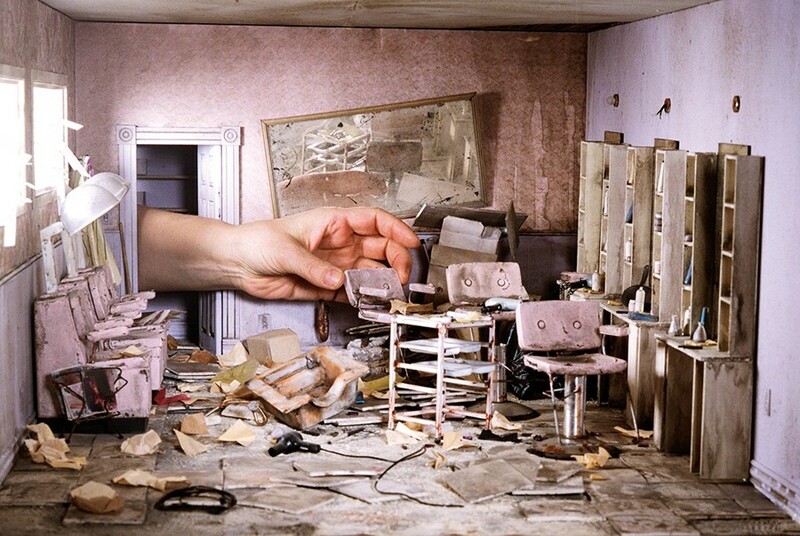 Without any kind of digital manipulation, the miniatures and models she builds and presents on film depict cataclysmic manmade scenes ripped apart by some unknown inhuman force; they’re like a doll's house for fatalists: a trashed-out launderette, an overgrown library, a dilapidated theatre, each of these tiny displays make up a microcosmic world of the future, a kind of landscape photography at its darkest. It’s also an incentive to environmentalist or activist art that affects the viewer with its microscopic attention to details – that has landed Nix in museum collections all over America. The artist cites the dystopian cinema of the ‘70s, and natural disasters she experienced as a child growing up in rural Kansas as inspirations for the scenes she creates – as well as trashy science fiction and titles by authors such as Jan Zalasiewicz, Alan Weisman, and Matthew Goodman. Lori Nix: My name is Lori Nix. I live and work in Brooklyn, NY. By day I am a partner in a digital printing and retouching studio, JAM Editions Inc. in Manhattan. By night and weekend, I sequester myself in my apartment and build meticulous landscapes and architectural interiors and photograph them. Besides living in a small apartment, what influenced you to start creating dioramas and photographing them? Lori Nix: I am most comfortable working with my hands. I have a ceramics degree as well as a degree in photography. I've always been interested in the performative nature of photography. I have always expressed myself through the "constructed image. I started to get serious about photography when I went to work for my undergrad university newspaper, first as the darkroom technician, then as the photo editor. I was responsible for most of the photographic content to run in the weekly paper. I realized pretty quickly that I did not have a nose for news. I wasn't interested in chasing down the breaking news stories. I also know that I'm not much of a people person and wedding photography would not be a viable career opportunity. Because I was living in the Midwest (Missouri and Ohio), I couldn't imagine pursuing commercial photography - I had never experienced anything like it in my small communities. After I left grad school, I was living on about $25 a week in spending cash. Travel photography on this budget just wasn't an option. Here is where I began building my small dioramas on my kitchen table in the attic apartment. I am most comfortable to stay home and create my worlds rather than go in search of them. Your work is labor intensive and involves no digital manipulation. Talk me through the creative process and techniques that go into making one of your projects. Lori Nix: My workflow is: Come up with the idea and then wait up to two years before I begin the scene. I won't start it until I can see what I want in my head. Then I start to gather the materials. Kathleen and I will then go out for a nice breakfast with sketchpad and really hash out the diagram of the room or rooms we'll be building. We work in a variety of scales, sometimes 1:12, other times 1:8 and so on. The scenes I build today are mostly made by hand. There is usually one element I do not feel like creating, such as the piano in "Majestic". I found the piano and then scaled the rest of the scene around it. The size of the piano determined the size of the diorama. My scenes can be as small as 50x60 centimeters and as large as 182 centimeters in diameter. It takes approximately seven months to build and photograph a scene. I build it for one angle of view and never move my camera from that spot. I will change the lighting, the placement of the objects and re-shoot until I'm fully satisfied with the results. I shoot with an 8x10 large format camera and film. I print my own photographs quite large. You’ve exhibited extensively in the US, but in Europe you’ve only shown in Italy and Germany so far. Lori Nix: I have wanted a European audience for my photography for a while now. I knew it could be an amazing opportunity if I could just somehow reach across the ocean. Thankfully, the Italian art gallery owner Giampaolo Paci was in New York City for several art fairs and sent me an email asking if he could visit me in my studio. He had seen my work online and now wanted to see prints and my working process. We hit it off immediately, and within a year he offered me a solo show at Paci Contemporary in Brescia, Italy. The show at Galerie Klüser came about differently. Alexander Pühringer, the editor of a German art magazine, “Untitled, The State of the Art”, wanted to include me in an article. He had me participate in a conversation in my studio with another photographer, Brian McKee. Upon Alexander’s return to Berlin, he showed my work to a curator/dealer friend, who then introduced my work to Julia Klüser. While Julia and her father Bernd were in New York City for business, they came by the studio for a visit. An invitation to show in Munich came afterwards. The shows in Italy and Germany were amazing and I hope to be exhibiting again with each of them in the future. "All that's left of mankind is the cultural and economic spaces we once inhabited. Now these are falling into disrepair, and the native flora and fauna are overtaking them. Life still goes on, just not yours or mine. - Lori Nix"
How do you go about thinking of a particular scene for a project as they all show different aspects of abandonment or certain disaster? Lori Nix: I like to work narratively and serially. When I'm thinking of this series, I'm thinking 20+ images to complete the narrative. If I can't stretch an idea this far, then I'm not going to pursue it. I consider how each image is different from the preceding images in relation to its color palette, the disaster being depicted, and the layout of the space, even the placement of the line of view. The overall theme to The City is that something catastrophic has happened to mankind. I don't know if it's viral, nuclear, or a meteor hit earth and decimated the population. This is for the viewer to decide. All that's left of mankind is the cultural and economic spaces we once inhabited. Now these are falling into disrepair, and the native flora and fauna are overtaking them. Life still goes on, just not yours or mine. Do you believe in the apocalypse? What do you fear? 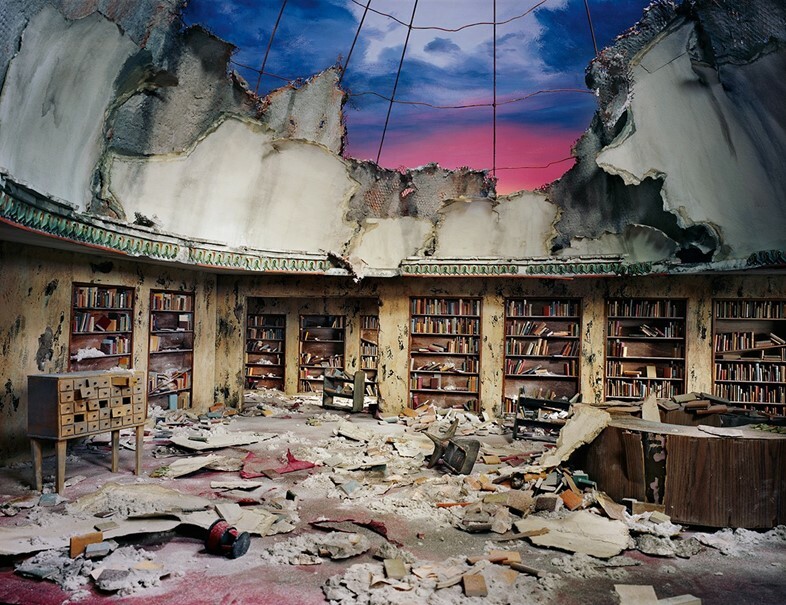 Lori Nix: I personally do not believe in the apocalypse, especially the biblical definition of the word. When I am lecturing at universities or photography conferences, I usually ask those in the audience to raise their hands if they believe in the zombie apocalypse. This helps to keep everything light and entertaining. (FYI, it’s not a big worry to all but a few). I have big world fears, but more pressing are personal fears. Fire in my apartment building is a big one. Last summer I was working one afternoon in the studio and thought my hot glue gun sure smelled extra smoky. Within thirty seconds two fire trucks pull up outside and start raising their ladders towards my part of the building. I immediately opened the window and hung my head outside to see what is what, and noticed the apartment below and to the side of me had flames shooting out the window. The fire department had the fire out in no time, but living in a residential building, you are at the mercy of your neighbors. I keep all my negatives in a fireproof safe now. I love this dichotomy between the cuteness of miniature and the destructive darkness of the scenes you create. I like the way you make the seemingly innocuous seem threatening. Have you ever considered displaying the dioramas themselves – why did you decide to present only the photograph as the final artwork? Lori Nix: I too like the craftsmanship that goes into miniature work. In all honesty, some of my dioramas grow quite large, up to nine feet in length. We work in various scales, the size determined by what my partner, Kathleen, and I can make look realistic. Miniatures are just a way of my creating a space, rather than going out to find something that already exists. I honestly would rather not show the dioramas for several reasons. First and foremost, I am a photographer, not a sculptor. I make these specifically to be photographed, and the photograph is the final product. Secondly, I make these for one and only one viewpoint, the camera. I only finish the side or sides that will be seen through the lens. And finally, I make these to last the duration of the shooting. I would rather not worry if my materials are archival, how best to uninstall and reinstall the dioramas, or if it will fit in my car for travel. The three occasions I have shown the dioramas were for museum shows whose specific theme for the exhibition was the “diorama”. And if there is an educational component to the exhibition, I’m all in. You mention working with a partner, Kathleen, how did you two start working together, and what’s the working dynamic? Lori Nix: Kathleen and I moved to New York together in 1999. We each found 9-5 jobs in Manhattan and then after work I would start fussing on my latest project. She’s a bit of a work-a-holic and couldn’t just sit still, so one day she asked if she could help. She’s been helping ever since. We divide up the work according to our skills. I have the big picture in my head. I know the color palette of what the scene is going to be. I pretty much know the layout of the space we will be constructing. Together we sit down and think of how we’ll detail the scene, what objects we want to include, decide what specific disaster we will be showcasing. I then get to work on the actual structure, the walls, floor, ceiling and furniture. Kathleen sculpts the details, makes tiny objects and then adds all of the paint finishes to make the diorama look old and decrepit. Was there ever something that just proved impossible to build in miniature? Lori Nix: My proudest achievement to date is being awarded a Guggenheim Fellowship in Photography. Even though only my name appears on the award, I couldn’t have done it without Kathleen’s dedication, as well as the help, advice, and support of some close friends. Thanks everybody!